Designed with a traditional style and strong build, this vanity is a perfect choice for any bathroom. With a white marble counter and brown solid wood base, this product is good-looking and useful. Put a nice touch on your bathroom's look with this vanity set from Wyndham Collection. The Fresca Kingston Antique Coffee Traditional Bathroom Vanity w/ Mirror features a gorgeous Carrera Marble 1 bullnose edge countertop with 4 backsplash and white ceramic undermount sink. The vanity itself has intricately carved columns, decorative moulding and dentil cornices that elevate its beauty. With two doors and four drawers, this vanity has great storage space. Antique bronze handles add to its elegance, while a matching rectangular mirror completes the look. This lovely vanity is available in multiple sizes and makes a stylish statement in any home. The Fresca Kingston Antique Coffee Double Sink Traditional Bathroom Vanity w/ Mirror features a gorgeous Carrera Marble 1 bullnose edge countertop with 4 backsplash and two white ceramic undermount sinks. The vanity itself has intricately carved columns, decorative moulding and dentil cornices that elevate its beauty. With four doors and three drawers, this vanity has great storage space. Antique bronze handles add to its elegance, while two matching mirrors complete the look. This lovely vanity is available in multiple sizes and makes a stylish statement in any home. 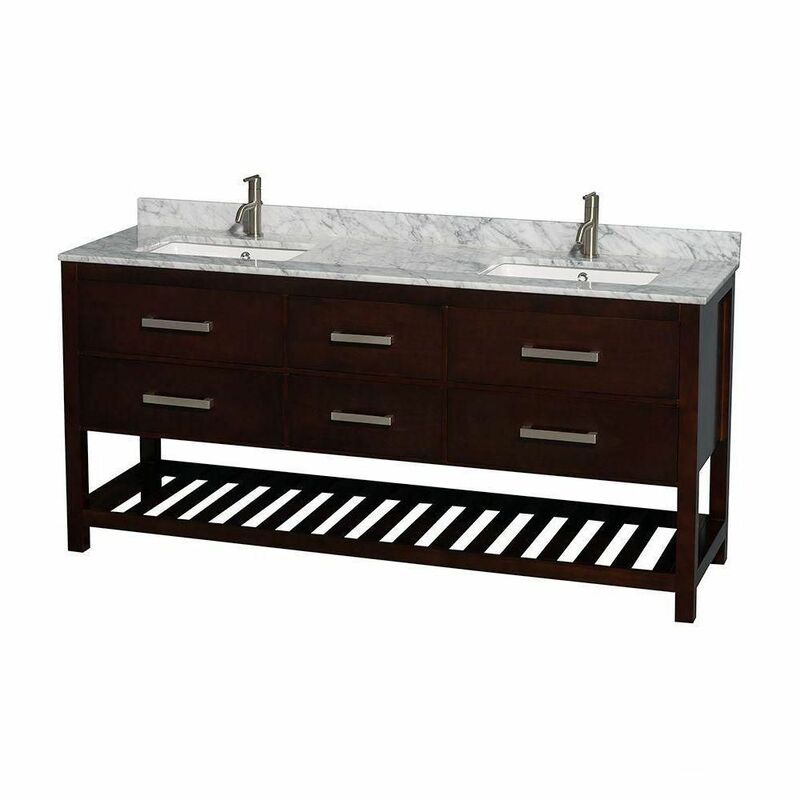 Natalie 72-inch W 4-Drawer Freestanding Vanity in Brown With Marble Top in White, Double Basins Designed with a traditional style and strong build, this vanity is a perfect choice for any bathroom. With a white marble counter and brown solid wood base, this product is good-looking and useful. Put a nice touch on your bathroom's look with this vanity set from Wyndham Collection.